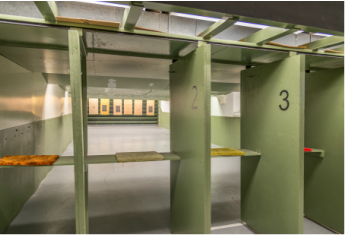 The indoor range is operated by a certified range safety officer, and safe gun handling is practiced at all times. The range includes six 50 ft shooting lanes. You can shoot .22 rimfire rifles and pistols up to .45 caliber - but no magnums loads. Shooters can opt to participate in the Winchester/NRA Marksmanship Qualification Program, and can qualify for awards and designations. The NRA qualification shooting is open to all members. Monday evenings during the winter - refer to calendar for specific dates. Firearms, ammo, empty chamber indicator, eye and ear protection. Empty chamber indicators must be in use when shooters are down range. When shooting line is full, members receive priority over guests. There is a $1.00 range fee collected that is put toward the cost of targets. Most targets are available to shooters.